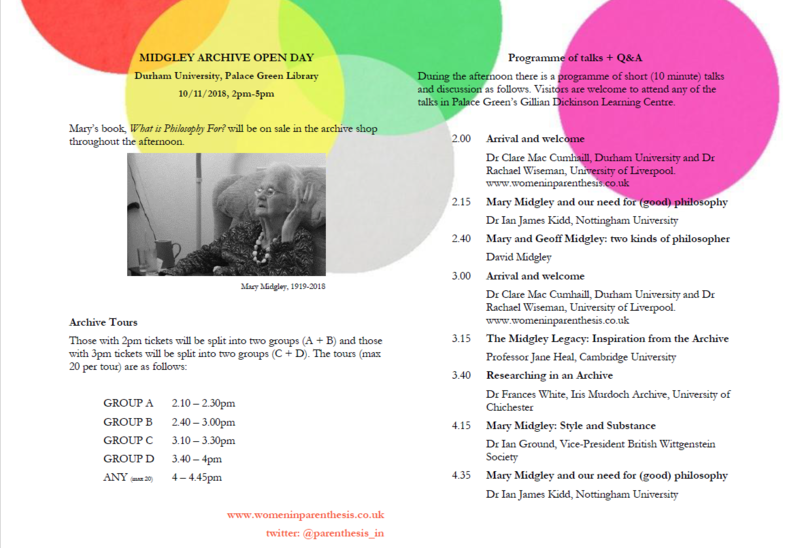 Durham University’s Palace Green Library has acquired the archive of the world-famous philosopher Mary Midgley. The archive is a major acquisition for Palace Green Library and a launch event, supported by the Royal Institute of Philosophy, will be held on Saturday, 10 November. Mary Midgley was one of the world’s leading philosophers and her work continues to shape the way we think about human life and our relation to each other, to animals, and to nature. Born in London, Mary lived in Newcastle upon Tyne for many years until her recent death at the age of 99. She was awarded an Honorary Doctor of Letters by Durham University in 1995. The extensive archive contains material relating to Mary’s philosophical work including published articles, talks, notes and correspondence. The launch event will include a talk and presentation by Dr Clare Mac Cumhaill (Durham University) and Dr Rachael Wiseman (University of Liverpool) as well as a number of special guests — Professor Jane Heal, Dr Ian James Kidd, Dr Ian Ground, Dr Frances White and David Midgley. There will also be a chance for guests to view some of the collection’s highlights, with commentary provided by archivist Andrew Gray. Mary Midgley, who sadly died very recently, became an increasingly significant figure in philosophy and in wider public debates over the past few decades. The launch of her archive in Durham is a significant moment in the intellectual history of our times, and The Royal Institute of Philosophy is proud to be associated with it. The launch and opening of the Mary & Geoff Midgley Archive will take place at Palace Green Library, Durham on Saturday 10 November. The event is free of charge and refreshments will be available. There are timed tickets to view the collection at 2pm and 3pm, but guests are welcome to come to any of the talks, which take place between 2-5pm for the scheduled talks. For more information contact Dr Clare Mac Cumhaill on telephone +44 (0)191 33 46587 or email: clare.maccumhaill@durham.ac.uk. This is a ticketed event. 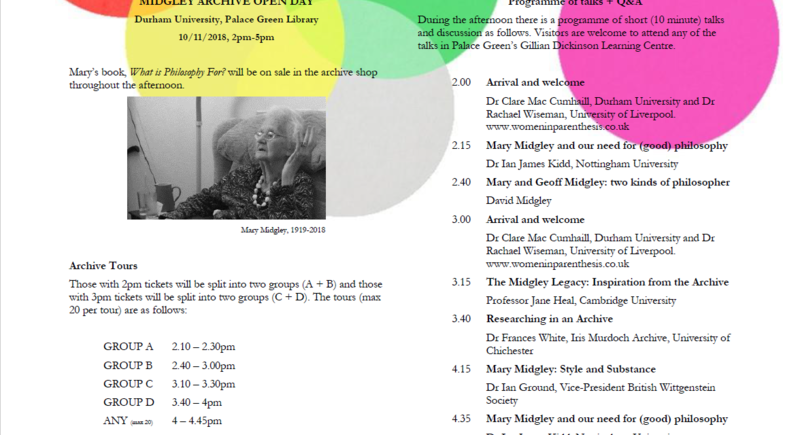 Tickets may be booked via Eventbrite at: www.eventbrite.co.uk/e/mary-midgley-archive-launch-tickets-50065326740.